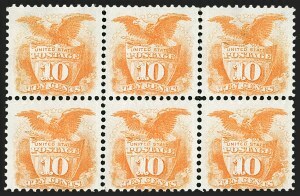 When this block was exhibited by Ernest R. Ackerman, a New Jersey state senator and U.S. Congress representative, in 1913 at the New York International Philatelic Exhibition, it was ten stamps larger, with two more rows at the top. 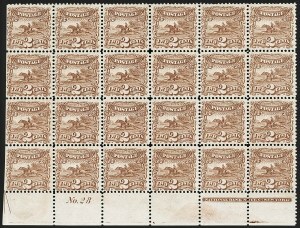 When the Ackerman collection was dispersed through private and auction sales before and after his death in 1931, the block of 25 was acquired by Philip H. Ward, Jr., who described it in his 1960 Congress Book article on classic unused multiples as the largest known. It passed to the Weills when they bought the Ward estate in 1963, and two years later, the block joined other stellar classic multiples in the Benjamin D. Phillips collection. 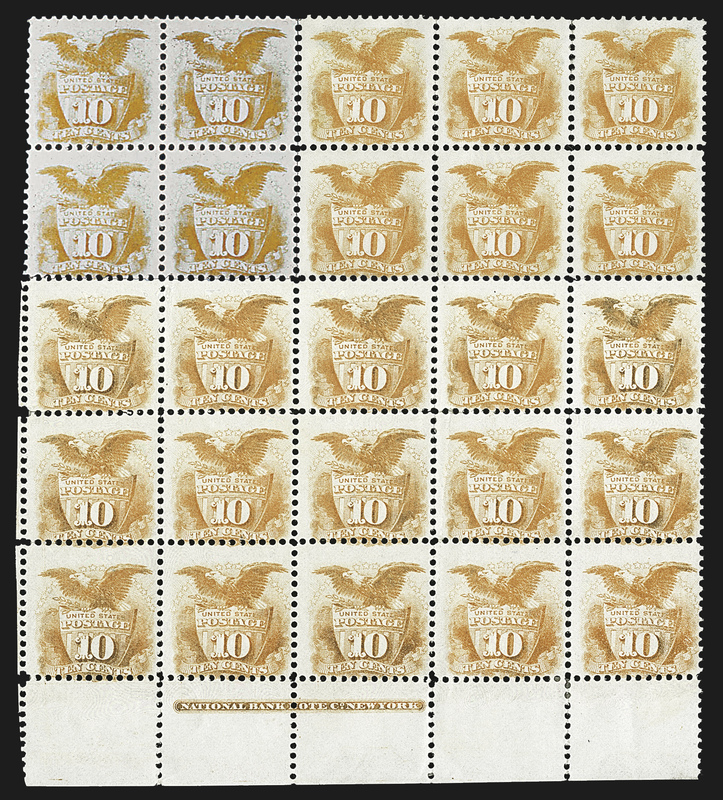 After the Weills bought the entire Phillips collection for $4.07 million in 1968, the brothers carefully separated the top two rows and subdivided those stamps into blocks of six and four (the block of six is offered in the next lot, and a reconstruction of the block of 25 is shown opposite). The census of 10¢ 1869 multiples maintained by Michael Laurence since he published it 45 years ago (Chronicle 81, February 1974) still lists this block as the largest recorded multiple. It was followed by a block of nine, but that block has been reduced to a block of six. As other blocks have been reduced, today the second largest unused blocks are two blocks of six. Michael Laurence owned this block of 15 for many years. He was unable to identify the plate and pane from which it was printed, but we think we have answered that question. By comparing the relative positions of the imprint below Position 146 ("OTE CO. NEW YORK") and the plate guide dot of that position (lower left corner of design, bottom center stamp in this block), we have concluded that this block comes from the left pane of Plate 16. Laurence's 10¢ 1869 collection is one of the most outstanding single-stamp studies ever formed, and the block of 15 was a large yellow diamond in the king's crown, but prior to Washington 2006, Laurence was persuaded to part with the block so that Mr. Gross could display the largest recorded 10¢ 1869 block in his Grand Prix exhibit. This block of six was joined with the block of 15 offered in lot 99--a digital reconstruction of the original block of 25 is shown below. The full-size block was owned by Ackerman, Ward and Phillips. After the Weills bought the Phillips collection in 1968, the brothers carefully separated the top two rows and subdivided those stamps into blocks of six and four. The census of 10¢ 1869 multiples maintained by Michael Laurence since publication 45 years ago (Chronicle 81, Feb. 1974) still lists the block of 15 as the largest recorded multiple (lot 99 in this sale). It was followed by a block of nine, but that block has been reduced to a vertical block of six. As other blocks have been reduced, today the second largest unused blocks are two blocks of six, vertical and horizontal. The 1869 Pictorial Issue was a transformative set of stamps created during a period of historic transition. With their novel shapes and imagery, they reflected the choice of President Johnson's postmaster general, Alexander Randall, but they were inherited by Grant's new postmaster general, John A. J. Creswell. In the midst of Reconstruction's political controversies, the 1869s were spurned by the public and quickly replaced with the 1870 Issue, bearing traditional portraits of statesmen, war heroes and Founding Fathers. The four 1869 high values were printed in two colors. The 15¢ vignette is an engraving by Smillie, based on Balch's engraving from an 1839 oil painting entitled Landing of Columbus by John Vanderlyn. The block of 20, ex Worthington and Caspary, has been broken. Apart from the two plate blocks above, there is only one other plate number block (of six, ex Wunderlich). The bicolored 30¢ 1869 Pictorial Issue was printed from separate plates of 100--the Eagle and Shield plate with imprint at bottom (in Carmine) and the Draped Flags plate with imprint at top (in Ultramarine). Regardless of the printing, paper type or presence of a grill, the block offered here is the largest recorded 30¢ 1869 multiple. The second largest is a used block of twelve (Scott 121). 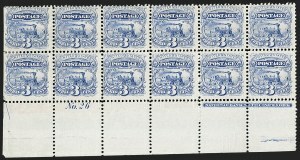 The second largest unused multiple is a block of eight of the Without Grill/Double Paper variety (Sale 1185, lot 58). 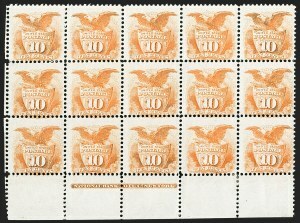 The largest unused multiple of Scott 121 is a block of six, and the largest of Scott 121a (without grill, normal paper) is a block of four. Equally, if not more important, the block offered here is one of two 30¢ 1869 blocks with the plate number. The other is the block of six shown in the digital reconstruction on the page opposite. 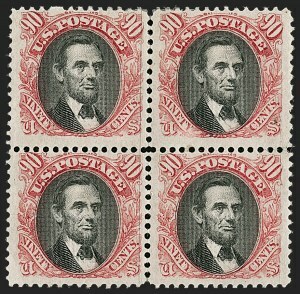 The only other examples of 30¢ 1869 stamps with plate numbers are Scott 121 in an L-shaped strip of four with bottom Carmine "No. 21" and part imprint (Sale 1118, lot 98), and a used Scott 121 single with Carmine "No. 21" (Sale 1118, lot 99). Apart from stamps, there are plate proof multiples with numbers. block of fifteen, three other sheet-margin blocks and a number of singles and interior blocks originate from a large multiple spanning the right and left sides of one sheet of 100 printed on experimental double paper without grill (a variety of Scott 121). 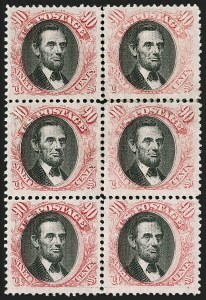 The 30¢ 1869 Without Grill/Double Paper block was described by John N. Luff in his book, but over the years, stamps from this multiple have been offered and certified as Scott 121a, without grill on ordinary single-layer paper. The 30¢ 1869 Double Paper/Without Grill variety exists in top and bottom imprint multiples, which show that the Flags plate did not have a plate number at one point. However, plate proofs exist with the "No. 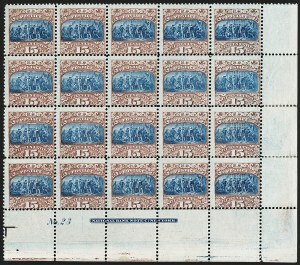 21" present, so it is possible that issued stamps exist with the plate number at top in Ultramarine. No top-margin examples of the normal 30¢ 1869 are known, with or without imprint or plate number. 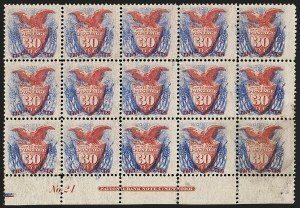 Therefore, it is impossible to say with certainty that the regular 30¢ stamps were printed from a Flags plate with plate numbers or without them. Since the Double Paper/Without Grill sheet does not have a Flags plate number, it probably comes from an early printing. 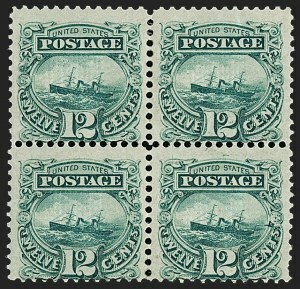 When this block was exhibited by C. E. Chapman at the New York International Philatelic Exhibition in 1913, it was a larger size (25 stamps), but by the time it was offered in the 1933 Hind sale, it had been reduced to its present form. The bicolored 90¢ 1869 Pictorial Issue was printed from separate plates of 100--the frame plate in Carmine and the Lincoln portrait plate in Black. The stamp was designed by a National Bank Note Co. employee named E. Pitcher. The vignette, adapted from photographic portraits taken by C. S. German in 1861 and Matthew Brady in 1862, is the same engraving by Joseph P. Ourdan that appeared on the 1866 15¢ Lincoln stamp. The frame was engraved by D. S. Ronaldson, and the lettering by J. C. Kenworthy. In addition to the five intact blocks, there is an unused reconstructed block of eight assembled from the four original contiguous vertical pairs (PFC 249455, ex "Lafayette"). Regarding the origin of this block of six, Ward stated that, "[this block is] ex Ackerman and Sinkler. This came from an irregular block of sixteen in the Hiram E. Deats collection which was sold some time back. This block was broken at the time. Mr. Deats wrote us that this had been acquired from E. B. Hains at $150 many years ago and it was then considered an 'awful price.'" This is the only intact unused block of four in private hands. 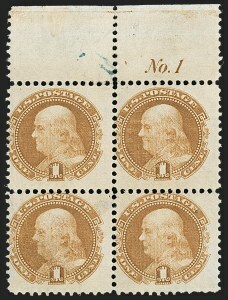 Its centering and rich color, as well as the full original gum, are outstanding qualities which are shared only by the ex-Caspary block of six (he owned two 90¢ 1869 blocks).